Continue Reading"Which width? (AIR on devices)"
My SimpleOscilloscope component described in an earlier post has now been updated to include a few filters controllable through setting styles. Of course like any other Flex component, it can have additional filtering applied in the normal way. I just felt like including these : alphaDecay, redMultiplier, greenMultiplier, blueMultiplier, blurX, blurY, scrollX, scrollY. As ever, the project is on google code, and the test bed is here. I needed a transparent bitmap. Reading the default “transparent:Boolean = true”, I assumed by simply supplying width and height, a transparent bitmap is what I would get. Not so! I got a white rectangle. The reason being, that the default fill colour is 100% white. (The first pair of FFs representing the alpha in ARGB). At first it would seem slightly unintuitive for the second default to conflict with the first, until one realises that the ‘transparent’ flag is there to indicate whether the object will support transparency or not. Not to state that it should be initially created transparent. Supporting transparency increases data size from 24 bits per pixel to 32 bits per pixel. In the majority of my projects to-date, I am the sole developer on the project team. I was feeling the need to get into writing Flex components to a level that they could be distributed. Essentially making sure I use meta tags correctly and adding appropriate asdoc comments allowing other Flex developers to easily include the component as they would any other from the Flex SDK. So, ccglib is an MIT license OpenSource project hosted on google code through which i plan to release a number of components. 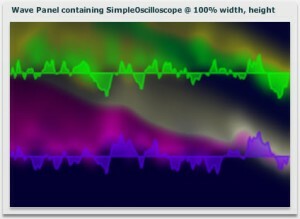 The first component released is SimpleOscilloscope, which plots the currently playing sound-wave. Designed to be easily sized, coloured and positioned through application of styles. Finally got around to adding a case-study to my corporate site including a screen-cast of some of the features of my longest running project, a Flex/AIR application for communicating football moves and plays. Essentially a digital, animated version of a football tactic board. More details and the screen-cast are on the creative-cognition case-study page. … at the London Flash Platform User Group… tomorrow (29 Jan 2009). Really handy! … ActionScript 3, Air and Flex documentaion distributed as an application on iPhone and iPodTouch – by Mike Chambers. Basically it’s a Flex Component explorer as an AIR application and Eclipse plugin.